Gold Shooting Shirt: On the front left tail is the Nike manufacturer's tag with the player number “8” handwritten in black marker in the player ID spot. On the left inseam is a flag tag with the shirt materials and washing instructions. In the rear collar is a Nike flag tag that reads “MADE IN THAILAND” size “XL” also with the player number “8” handwritten on it in black marker. On the left sleeve is a black patch that reads “DRI-FIT”. On the upper right chest is the official “NBA” logo and a purple Nike Swoosh logo both embroidered. Across the chest reads “LAKERS” in purple on white tackle twill. On the rear below the collar is another Nike Swoosh logo embroidered in purple and below that is the Los Angeles Lakers team logo patch sewn on. Purple Shooting Shirt: On the front left tail is the Nike manufacturer's tag with the player number “8” handwritten in black marker in the player ID spot. On the left inseam is a flag tag with the shirt materials and washing instructions. There is a hanging flag tag off the bottom right seam that reads “DRI-FIT”. In the rear collar is a flag tag that reads “MADE IN THAILAND” size “XL” also with the player number “8” handwritten on it in black marker. On the right sleeve is the official “NBA” logo and below is a gold Nike Swoosh logo both embroidered. On the middle of the chest is a Los Angeles Lakers team logo patch sewn on. 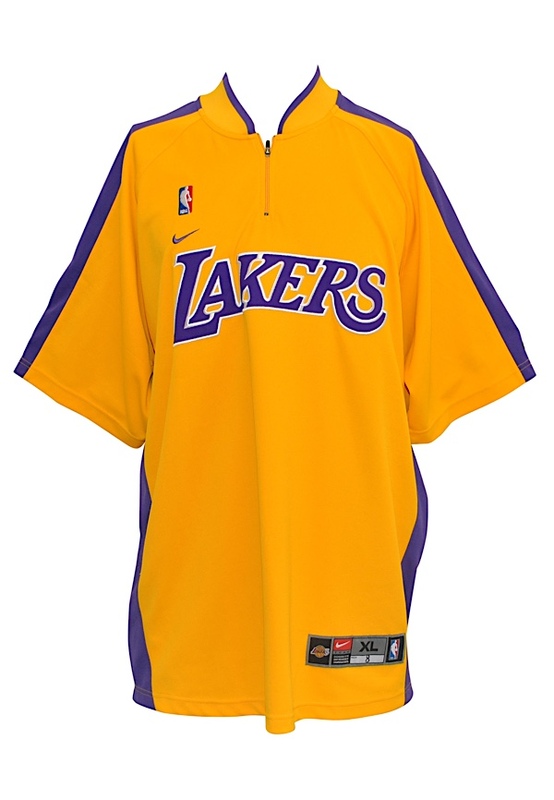 On the back embroidered beneath the collar vertically reads “los angeles lakers” in white and gold. These shooting shirts are properly tagged and were presented to us as player-worn attributed to Kobe Bryant.